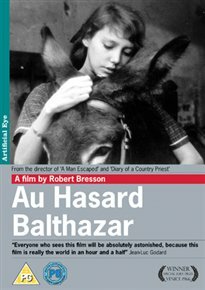 Robert Bresson’s – AU HASARD BALTHAZAR – out on dvd and Blu Ray. Robert Bresson’s classic allegory won the Special Jury Prize at the Venice film festival. A donkey named Balthazar passes into the care of a number of owners, each of whom displays mankind’s capacity for kindness or cruelty: a group of young girls use it as a plaything; it becomes a circus attraction; and eventually ends its days as a drug smuggler’s ‘mule’. Jean-Luc Godard described the film as presenting ‘the world in an hour and a half’.